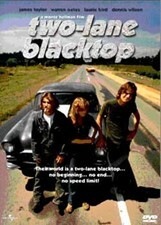 Director Monte Hellman's acclaimed road drama features rock stars James Taylor and Dennis Wilson as two car-obsessed wanderers in a '55 Chevy who are challenged to a cross-country race by Warren Oates and his brand-new GTO. Their race turns into a rambling odyssey fueled by an offbeat series of encounters along the way. With Laurie Bird; look for Harry Dean Stanton as a hitchhiker. 103 min. Widescreen (Enhanced); Soundtracks: English Dolby Digital 5.1, Dolby Digital mono; audio commentary; featurette; interviews; outtakes; theatrical trailer; screenplay booklet; more. Two-disc set.